Update 8/20/12: This project is over two years old at this point, and I am no longer working on it. This was a proof of concept and, unfortunately, I am no longer able to provide support to readers with questions. It's been a great year for Ruby on Android, but no one knows it. You can start writing Ruby apps for Android devices TODAY. You don't need to install any SDK, you don't need to install some giant Eclipse IDE, and you certainly don't need to write any Java. Some of you may have heard of Ruboto, but Damon Kohler and the team at android-scripting have been quietly improving SL4A over the past year, adding tons of features and improving stability. There's even support for distributing programs as APKs, so the implementation language and dependencies are totally transparent to users. We'd love to run some simple Ruby scripts on Android, but what about running a complete, albeit simple, application? Will it work? Most Rubyists use Ruby to build web applications, so let's run with that. Let's build a spy camera app, so I can figure out who's been stealing ink cartridges from our office. The app should (a) show me a snapshot of what the camera currently sees and (b) update that snapshot on demand. We need a simple, lightweight ruby framework to use. Sinatra is very easy to use and should even be able to run on older Android devices. Similarly, we need a simple, lightweight, pure ruby web server. WEBrick is pure ruby, part of the standard library, and fast enough to run on Android. Works for me! First, let's work from our development machine (i.e. laptop). No need to touch the phone just yet. But wait! What about Sinatra itself? We can't easily install rubygems on our Android phone, so we'll have to vendorize Sinatra and all dependencies and ship them with our application. Since we'll be running JRuby on Android, we can't use any libraries that have native C extensions or are otherwise JRuby-incompatible. 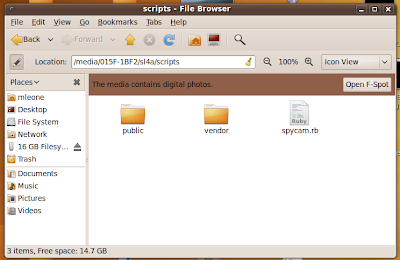 Create a file called spycamera.rb in the project directory. First, let's set some constants for the important directories in our application. When running apps under SL4A, we need to be very explicit about directory paths. Let's update our load path, so JRuby can find our vendorized gems. Next, we'll load Sinatra. We'll have to explicitly load rack first, to avoid uninitialized constant errors under SL4A. Finally, we require the Android API interface, available under SL4A, and initialize an Android object. This will allow us to make API calls, like one that tells the camera to take and store a picture. Now, let's create a very simple HTML template. The template should just display the latest snapshot, which we'll be saving to public/latest.png. If I click on that snapshot, it should take a new snapshot and refresh the page. 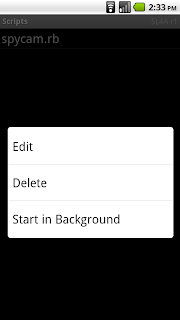 Finally, create a tiny Sinatra app that takes a picture, saves it, and renders the template. Now you can finally use your phone! Grab that Android device and install SL4A (r1 APK available here). Run SL4A, go to the interpreters menu, and install JRuby. Once JRuby is installed, it's time to deploy your application to the phone. Connect your phone to your development machine via USB, and simply copy the contents of your app to SL4A's script directory on your phone. There may be some sample ruby scripts left over from the SL4A install; you can delete them if you like. Copying the project contents onto the deivice. At this point, just run spycam.rb from SL4A and you're good to go! Place your newly-activated spy camera somewhere, hide in your office/cube, start your web browser, and navigate to http://ip.address.of.phone:4567. You can do this from inside your local network via wifi, or, carrier permitting, over 3G. Check out my open-source project, Broadcast, on Github. It's a more refined, general-purpose embedded web app for Android. It allows for further remote monitoring and control, such as location tracking, remote text-to-speech, and remote file management over HTTP. 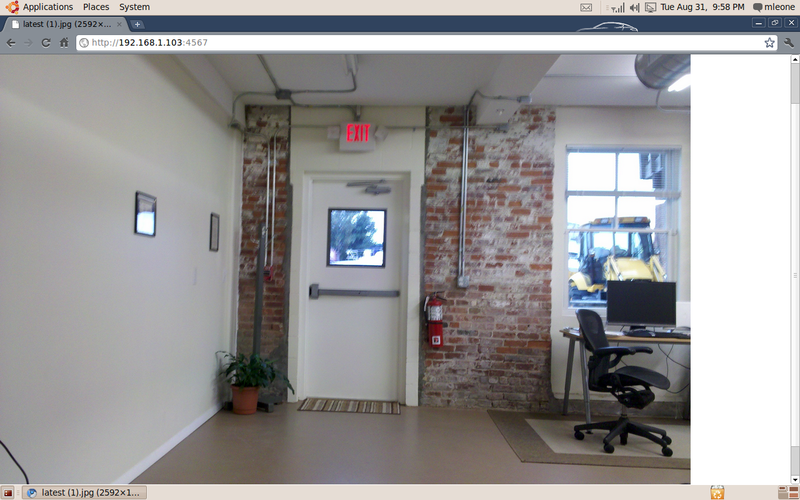 The source code for the spycam app is available on github here. Sigmar, thanks for the heads up. I fixed the error, and changes have been pushed here. One problem however, I hear my phone taking the pictures, but they are completely black, any idea? Spint, if your camera normally works fine but isn't taking pictures properly with this app, it's probably an issue with SL4A and the HTC Hero in particular. You should file a bug here; the team is always improving support for more devices. At first, camera support for my Motorola Droid was a bit spotty, but I filed a bug and they had it fixed and released within a week or two. Ok Mike, apparently there was already a related issue (#400), tnx ! Great! I tried it on my Nexus One and works! JRuby crashes from time to time, though. I'll play a bit with this, thanks! I get the same error on my HTC magic, after a few minutes webrick starts up. Because my phone is rather slow i suspect thats wat's causing the error, works later on. This is freaking kool... thanks dude !! I get to the part where I have successfully installed SL4A. Can you clarify the step to "go to the interpreters menu, and install JRuby"
I found the intepreters menu and ran the shell. What is the syntax for installing jruby? Nevermind..I'm new to this android scripting..I found JRuby now. Any suggestions? I saw tilt listed in the base.rb but not sure what path it's looking for the file at. Woohoo!! Finally. I got it. This is cool. I did not have a tilt.rb file and I also replaced the sinatra base.rb with what was on github. NOt sure which did the trick but I was able to see the snapshot through the wifi connection on my desktop. Great tutorial and program. I have been playing with Ruby on Rails for a couple of weeks but still tying to run my old app in Ruby192. This works after including the tilt gem into the vendor dir. Sinatra is really simple compared to rails. One issue is that the Samsung Moment makes a shutter sound when it takes the picture. Kind of defeats the "spy" aspect. Also the server seems to stop running after a while. sl4a_r1 is now deprecated, and the latest version is sl4a_r4. JRuby install has a second install step... the initial JRuby app is actually an installer which you need to run. And you need to unpack into target the tilt gem, as described by the previous comment. Thank you for a high quality tutorial! Scriptable devices = future? A dream? You revealed this is present. For us non-technical geeks can we not have a simple app that installs and is hidden and doing the same job. A covert camera/web cam monitor that can be viewed by connecting to phone's IP or IMEI? For some reasons, server stopped running after taking photo. Anyways, it was a great tutorial and proved that Rails applications can run on limited environments like android OS. Hidden spy cameras can provide a great benefit to people if they use them properly. For many people, the reason that they use a hidden camera is to keep watch and monitor people, places and things they they're concerned. The uses of a Spy Camera other than spying. Most people think that only government agencies and professional spies need a spy camera. This could not be further from the truth as they offer plenty of benefits.